Joe Perry launched his Dafabet Northern Ireland Open campaign around familiar faces in Belfast last night - by playing and beating the man he is sharing an apartment with. The Chatteris potter and opponent Gerard Greene have long been friends on and off the tour, but found themselves up against each other for the first time in six years on the opening day. Greene had always been the victor in prior meetings, but the world number 22 finally got one up on the Northern Irishman, prevailing in a deciding-frame finale that stretched into the early hours. But the late finish couldn’t take away any of the good nature away from either player, though it was Perry who had the larger smile after securing his place in round two at the Waterfront Hall with a 4-3 victory. “We tend to share an apartment whenever we go to competitions and we’d sorted this one long before the draw came out,” said Perry. “I’ve got him at 3-2 up and then he’s made a ridiculous red, scored 50 off it and got to 3-3 and when he’s done that I’ve just sat and thought ‘here we go again’. “I’d never beaten him in a match, I’ve always beaten him in practice, but in matches he always seems to get the better of me. We’ve had a few deciders and he’s always won them. “I didn’t want it to go nip and tuck because he’s always good in those sorts of frames, we both know how to play and neither of us allowed it to be scrappy which was a nice position to be in. Going all the way in, at times lengthy frames, both showed their experience at key moments as Perry opened up a 2-0 lead early on. 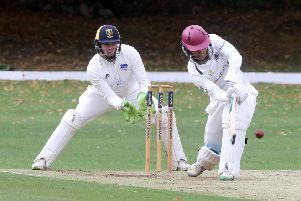 Breaks of 74 and 85 did the damage there but, after going 3-1 up, the advantage fell away as Greene battled back with his own half-centuries, 67 and 61 in frames five and six. That prompted a decider from which only one winner looked likely, with Perry clinical from the off with a break of 90, and he is now looking forward to Wednesday’s second-round clash with either Rhys Clark or Matthew Selt. “I feel like I’m playing a lot better now than I did in the early parts of the season,” Perry added. “I was like that in Shanghai too but ran into Ronnie O’Sullivan so that’s the end of that, but I’ve had a couple of good matches recently and it’s nice to feel in that position. “When the chances are coming along I’m taking them, and I finally feel that I’m getting into a bit of form. “It’s not the stuff that is tournament-winning form, but I’m getting a few matches together and I’m definitely playing much better than I was two or three months ago.